I am over the moon to have our romantic wedding inspiration featured on Weddings Unveiled today! 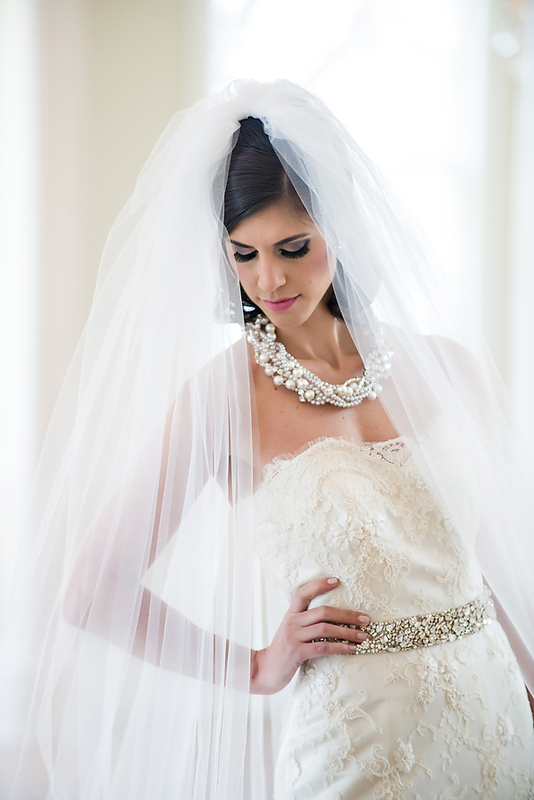 I have to extend a big huge thanks to Allison Kuhn Photography for all the gorgeous images! We were presented with many challenges in executing the shoot - the monsoon of a rain storm being the biggest of all. But thanks to Allison and Lindsey Regan Thorne of Be Pretty we moved on to plan B, and I think the end result is still absolutely stunning! Working with a talented team of vendors makes the biggest difference in the world, and I am so honored to have had the chance to work with an incredible team! 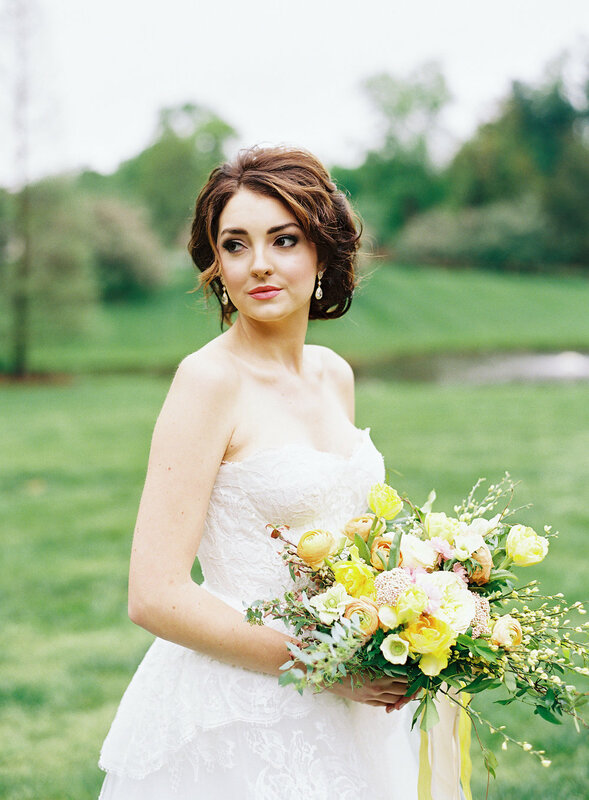 Our inspiration came from the effortless elegance of Southern brides. Since lace, vintage touches, and a crisp white tuxedo are some hallmarks of Southern weddings, I took those elements and gave them a unique twist. 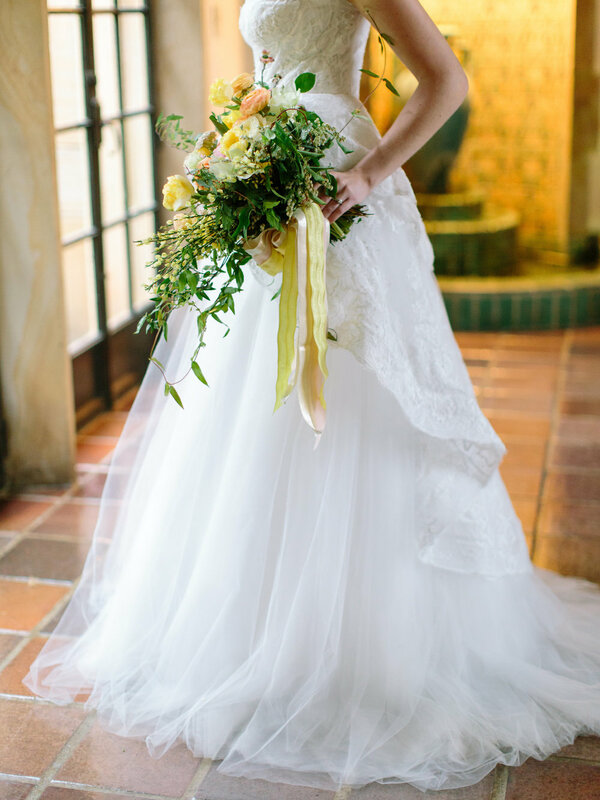 The brides stunning Monique Lhuillier gown from Nitsa’s is a perfect example of a classic silhouette that has been modernized with a fun and flirty high low-esque skirt. 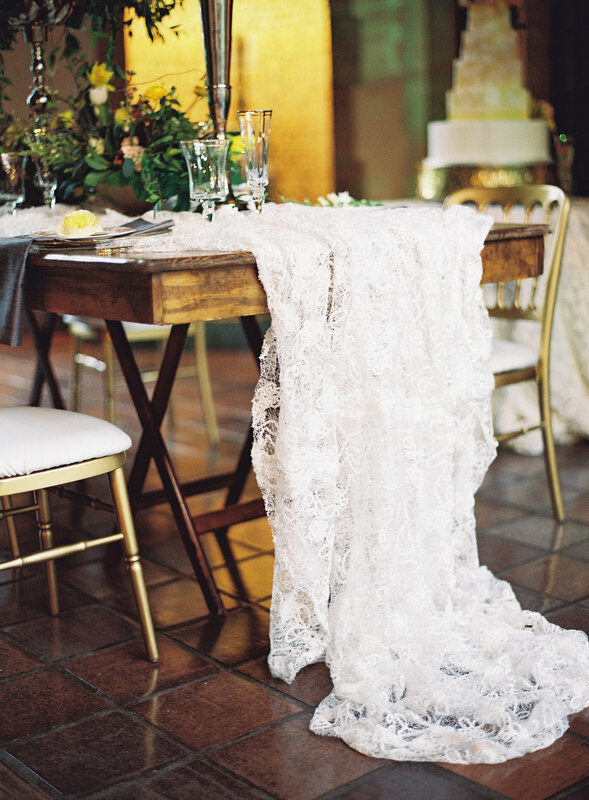 I fell in love with the addition of the beautiful lace linen from Nuage Designs to our tablescape - it was the perfect way to add lace to our dining table! 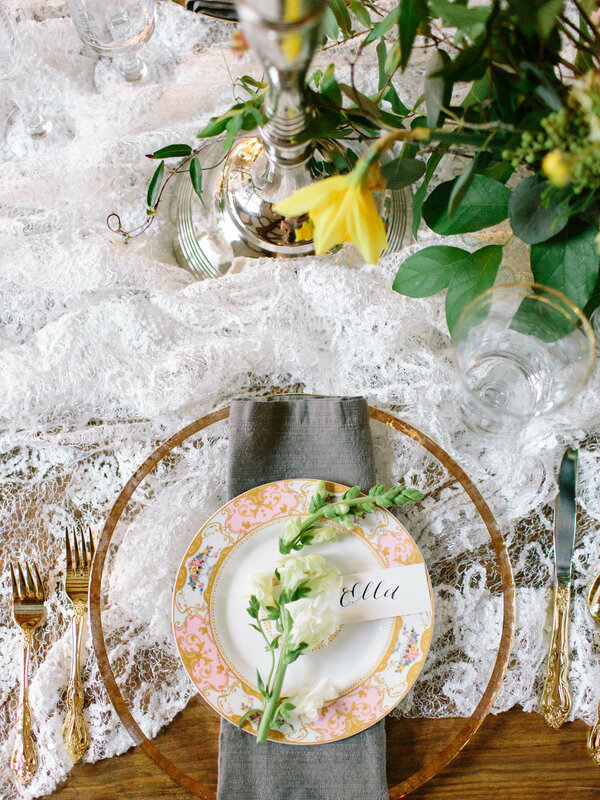 I brought in vintage china from Party Reflections for just an extra pop of color at each placesetting and added a flower with calligraphy place cards by yours truly. The color palette was one of my favorite aspects of this shoot! I am in love with the combination of pale yellow, blush, peach and green! The design is a mixture of classic and traditional Southern elements done in an elegant and sophisticated style. Be sure to check out the full feature on Weddings Unveiled! Here are a few of my favorite photos from the shoot. I absolutely LOVED this shoot, and I was so honored to see it featured on Inspired by This on Cinco de Mayo!! Last summer, Charlotte Wedding magazine asked me to design a fiesta-inspired wedding for the summer issue. (And, brides even voted the design to win a 2013 BOW Award!) To now have one of my all-time favorite blogs feature it, is so exciting! Be sure to check out the full feature here, and scroll through some of my favorite photos - all captured perfectly by one of my favorite photographers in Charlotte, Smitten and Hooked. These two are amazing! This whole shoot makes me want to throw a BIG party! Absolutely love how everything turned out… I couldn't have asked for more. All the amazing vendors and talented wedding pros that participated in this shoot are nothing short of incredible! I'm so grateful to have had the opportunity to work with so many amazing vendors to produce this shoot for Charlotte Wedding magazine. They helped me bring this vision to life! Photography by Smitten and Hooked | Wedding design and styling by Ashley Culicchia Cash, The Graceful Host | Fashion styling by Laurel Bendum of Charlotte Wedding magazine | Produced by Aleigh Acerni and Kellie Duff of Charlotte Wedding magazine | Shot on location at Brakefield at Riverwalk | Floral design by Lily Greenthumb’s | Catering and cocktails by Something Classic Catering & Cafés | Cakes by Wow Factor Cakes | Mexican cookies by Suarez Bakery | Rentals and linens from Party Reflections of Charlotte | Paper goods by Three Little Birds | Makeup by Casey Lombardi, Dollface Skin & Makeup Lounge | Hair by Lindsay Pizzuti, Mirror Bomb Studios | Gowns worn by the bride: Marisa - style 898 from Hayden Olivia Bridal, Intuzuri Augustine from Poffie Girls, Watters Blanca gown from J Major’s Bridal Boutique, Modern Trousseau Marena gown from Hayden Olivia Bridal, & Tadashi Shoji dress from Neiman Marcus. Oh my goodness! I am SO excited and honored to see my "beauty in simplicity" wedding inspired design was featured on the amazing Ruffled Blog! Y'all, I had way too much fun designing this wedding inspiration. And, the incredible photographer capturing all the details was the oh so talented Crystal Stokes of Crystal Stokes Photography - what an eye this gal has! For a long time now, I wanted to plan a shoot that celebrated simplicity because I am a firm believer that less is more. It's easy to get caught up in the tiny details when planning for a wedding, and often times brides get lost along the way, loosing the bigger picture and feeling like they need to keep adding and piling on detail. But, there is so much beauty in simplicity, and I think this is an idea that is often forgotten and overlooked. So, we wanted to take a chance to really celebrate simplicity and show brides how beautiful, sophisticated and elegant simplicity can be. I am so excited to share with you some of my favorite detail shots. But, hop on over to Ruffled Blog to see more of the feature! Absolutely LOVE colored glassware! And how perfect are these ruffled plates?! I want to steal them so badly! Have you ever seen a more perfect cake?! I am in love with naked cakes, y'all. This is so stunning! And, how adorable are the little tarts? Sweets tables are my favorite. 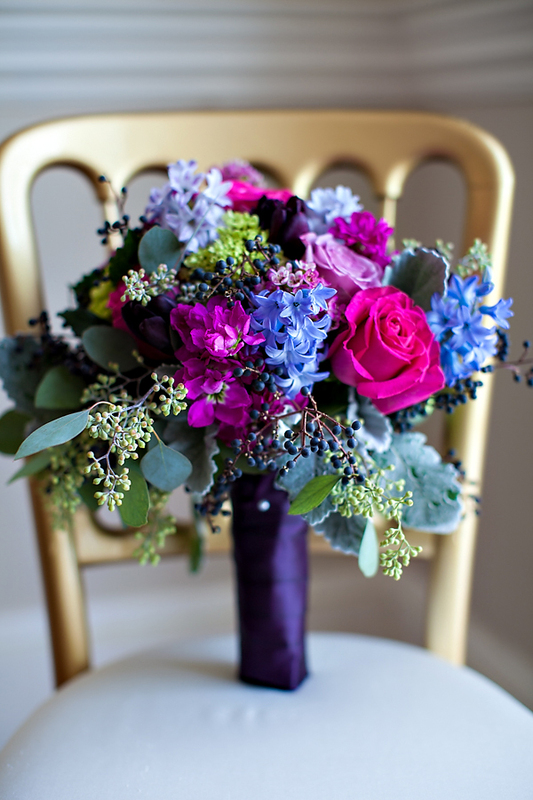 The bridal bouquet was out of this world gorgeous! I love the "wild flower" look and the gorgeous jewel tone colors that popped perfectly against the natural decor and landscape. Such a beauty - I absolutely LOVE this look! You guys - this is an actual a real couple! Our models were such troopers… and, talk about good lookin'!! Ow! Ow! Gorgeous hair and makeup by Erin Ashley Makeup and Mirror Bomb Studios - perfectly captures the look and feel of the design. The paper goods were out of this world beautiful! I love the addition of lavender - such a treat for the senses and it works perfectly for our natural and simplistic design. Even the response card envelope was made of seeds and could potentially be replanted! How cool is that?! This ceremony arch made of garland and driftwood is one of my favorite details! SpringVine Design did an incredible job crafting this on-site for the photo shoot. I wish I could have one of these at every wedding! It's really stunning! One of my favorite photos from the day. Oh … be still my heart! So gorgeous! Oh man, I could go on and on and on! I'm a total sucker for these details, y'all. And, our entire vendor team was absolutely incredible - I'm so honored to have had the opportunity to work with each of these talented wedding pros: Crystal Stokes Photography, SpringVine Design, Elisabeth Rose, Sky's The Limit Custom Cakes and More, Erin Ashley Makeup, Mirror Bomb Studio, Party Reflections, J Majors Bridal Boutique, & The Laboratory Mill. A big, big thank you for donating your time and talent to this shoot! And a huge thanks to RuffledBlog for featuring my design! I'm so ecstatic to share our big, big, big news! 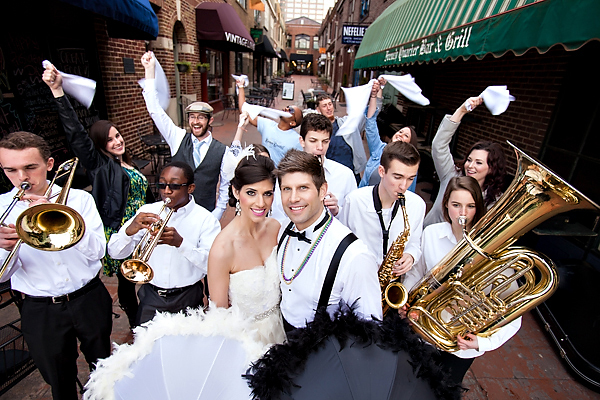 Our Mardi Gras Wedding Inspiration shoot is featured on Southern Weddings - and on Mardi Gras Day, Fat Tuesday! Oh, be still my heart. It is an absolute dream come true to see my work featured by a publication that I admire and love so dearly! I'm humbled to think that brides from the Carolinas to the great state of Louisiana will be inspired by the unique and fabulous culture of New Orleans. Really, I feel like someone should just pinch me! You never know why certain people are placed in your life. And, I do truly believe that God does place people in our paths. Julie Staley of Old South Studios and I met at a wedding earlier this year - and it was our first time working together, too. At the end of the night Julie says, hey do you want to design a Mardi Gras wedding for an inspiration shoot? The rest is history, of course, and I just can't help but believe that we were meant to work on this project together. In that moment, I was thinking YES!, YES!, YES!, and later told Julie that I was actually born and raised in New Orleans. I had a million ideas to share for the shoot! First and foremost, the most important aspect of the design was to infuse the energy of Mardi Gras and unique characteristics of traditional New Orleans weddings. I wanted this wedding inspiration to be as authentic as possible, so we incorporated real New Orleans wedding traditions - a second line complete with boa-lined umbrellas and a jazz band, and cake pulls to name a few. To me, New Orleans is full of life in every way. It's people full of personality and passion; It's architecture full of character and poise; It's landscapes expressing charm and a rich history; It's food full of flavor; It's creativity expressing the unique voice of its' artist; and it's celebrations full of energy - Each element is beautiful in it's own way. So with that inspiration in mind, I started to pull together a design plan. With the idea of Southern elegance, we choose to have the shoot at the stunning Separk Mansion - a renovated venue full of natural light, gorgeous chandeliers, and rich wood floors. Chelish Moore of Chelish Moore Flowers took my vision and ran with it, incorporating gold candelabras, vibrant flowers and candles upon candles. 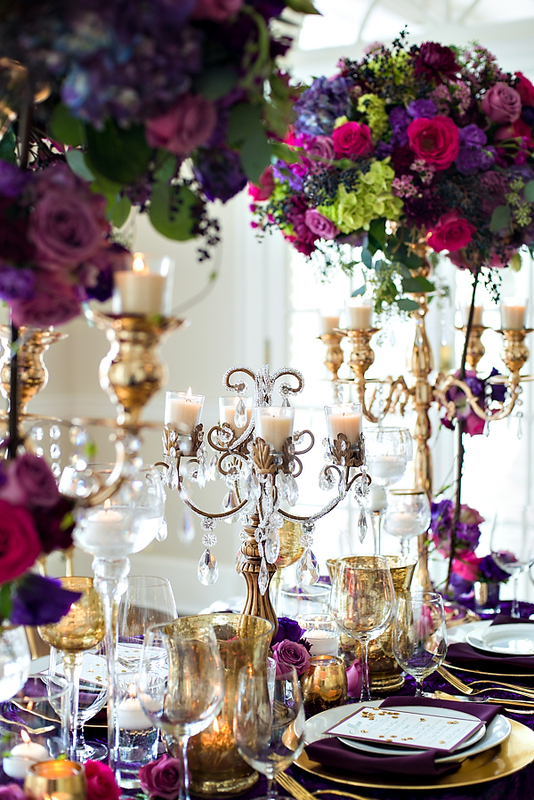 I love the sophistication and luxury of the floral design! Best Impressions Caterers provided a delicious menu, influenced by the incredible food and unique flavor palette of New Orleans. The chef had all of starving by the end! And, of course they provided us with a creative signature drink that was naturally N'awlins. Elisabeth Connolly of Elisabeth Rose created all of the amazing paper goods, and incorporated the grace of New Orleans weddings. The incredible cake was crafted by Mandie Miller of Got What It Cakes. I love how she captured the grandeur of Mardi Gras through her design. 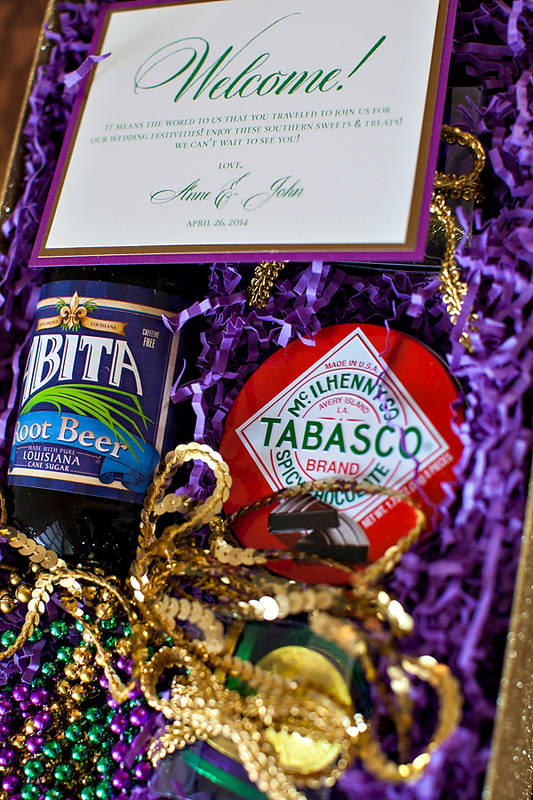 I just had to include a welcome box designed to greet guests upon arrival full of Louisiana goodies - Abita Root Beer, Tabasco chocolates, and Mardi Gras-inspired chocolate doubloons - tucked within a glittery gold box from Paper Source. Stephanie and John, our bride and groom for the day, are actually a real married couple - which I just thought was so perfect! The gorgeous bridal gowns were both by Modern Trousseau from their Fall 2014 collection ("Tate" and "Teacup") and came from Hayden Olivia Bridal. I am absolutely obsessed with these ultra glam dresses! They couldn't have been more perfect for the shoot. And our bride and groom looked picture perfect thanks to Erin Ashley Makeup and Adrian D. Howe Esthetics & Beauty. All of the rentals came from Party Reflections of Charlotte - Sara Shelor you are amazing! It is always a team effort to pull together a shoot like this, and I'm so grateful to each of the talented vendors that helped make my dream a reality. Especially Julie Staley of Old South Studios who allowed me to design every detail. Julie is so insanely talented, and her eye for capturing emotion and storytelling is incredible! I can feel her passion for the art of photography and the love of her job with each photo - I am so lucky she asked me to work with her on this project! 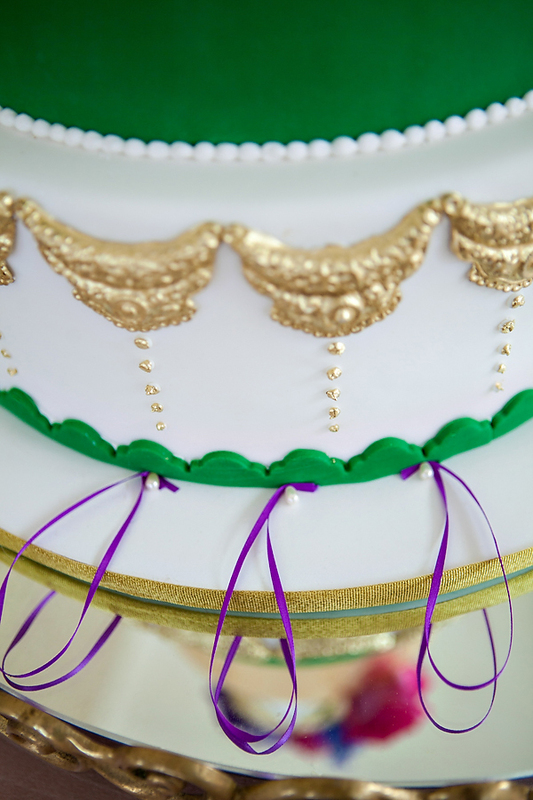 I hope you grab a big slice of King Cake and stay a while - come celebrate New Orleans on the Southern Weddings blog! 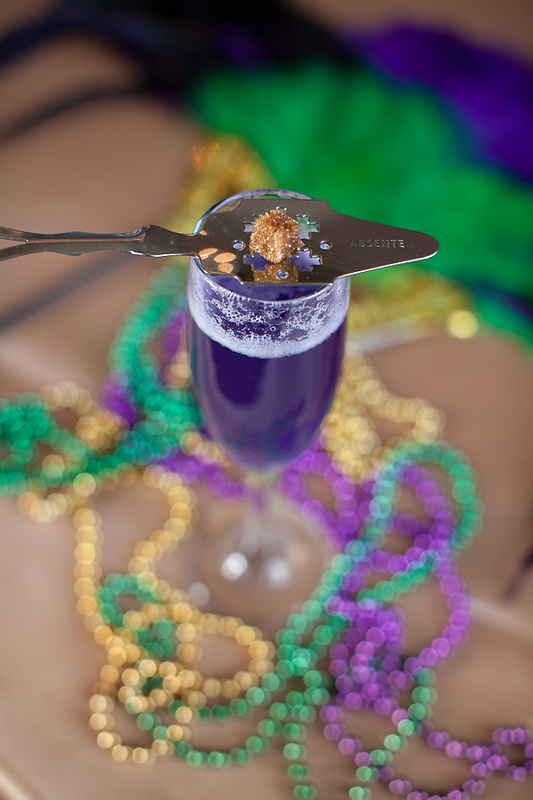 Happy Mardi Gras, y'all and laissez les bon temps rouler! Here are some of my favorite shots from this fun shoot!